If you follow us on facebook then you enjoyed a recent photo post titled, “Where do the Guides Go?” The photo offers a behind-the-scenes look at our guides’ extracurricular activities between hiking tours. (The activities that we can talk about anyway.) Just for fun, we offered a free Alps DVD to the first person to correctly identify the photo. Sadly, no one could do it. (We must confess, it’s a pretty tough image to identify). 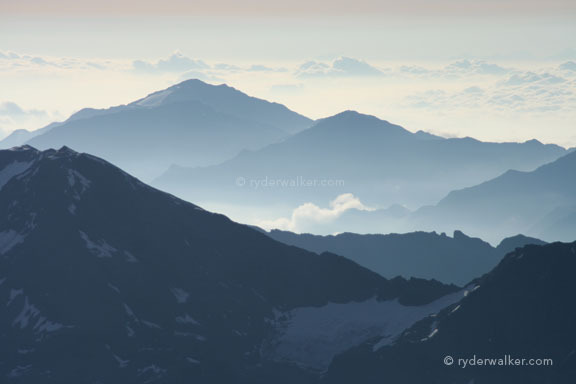 The location of the photo is the Ortler peak (3905 m) in the Südtirol region of northern Italy. Ryder-Walker Guides, Daniel Sundqvist and Ken Fuhrer, shot the photo while exploring a climbing route called the Hintergrat, a fairly exposed ridge that ascends the mountain from the east. You might ask yourself, “If this is northern Italy, then what’s the deal with the German words?” The answer is that the Ortler, and the surrounding Südtirol, belonged to the Austrian Empire before World War I. The border shifted when Italy annexed the region in 1919, a quite remarkable feat considering that Austria controlled the region for more than 500 years. Today, you’ll find translations in both German and Italian. The Italian name for the Ortler is Ortles. Daniel and Ken also shot the above photo during the same climb. For those of you that have ever wondered about hiking in this splendid region lying north and northwest of Merano, Italy; here’s a great look. These are the Central Eastern Alps, also known as the Southern Limestone Alps, and this is the domain of the Ötzi Trek.